John Alvin Hinson, 88, passed away Wednesday, January 23, 2019, into God’s care. He was born November 27, 1930 to Vurl Alvin & Jewel Belle Yeates Hinson in Lubbock, TX. He was a 1948 graduate of Patton Springs High School. He attended Texas Tech for a year. He married Bessie Irene Blackwell in 1951 and was then drafted into the Army in 1952, where he served as an MP in Ramstein, Germany. He returned to Odessa and began a career in Sales. In 1968 he married Cora Roman. He relocated to several cities in Texas while employed with Standard Vending and Music as a division manager. In 1991, he pursued a career change and attended Western Texas College, to become a Correctional Officer until his retirement in 1996. He is preceded in death by his parents, and sister, Betty Jean Baxter, son-in-law, John Dale Knight, daughter, April Lynn Patricia Roman Garcia and great-granddaughter Victoria Rose Rivero and son-in-law, Robert Garcia. He is survived by his daughters, Phyllis Ann Musitelli and husband James, Judy Kay Knight, Minnie Belle Collett and husband Rick, sister Sylvia Belle Rogers and husband Kenneth Young; grandchildren, Laci Seree Williams and fiancé, Chase Oxford, Jaime Michelle Nelms and husband Denver, Amanda Lyee Garcia and Husband Javier, Bobbi Michelle Garcia and husband Danny Ramos, Joshua Blake Knight and wife Abbie, Delynne Monet Collett, Jonathan Hinson Collett, Brielle Constance Collett and Crystal Marie Collett; great-grandchildren, Jaci Madison Williams, Cody Daniel Williams, Aspen Cole Nelms, Sydney Chey-Ann Nelms, Gabriella Garcia Rivero, Javier Roman Rivero, Isabel Lucia Ramos, Ileana Elvira Ramos, Izara Abril Ramos, Daniel Issac Ramos, Ayden James Knight, and Trig Ryan Knight. 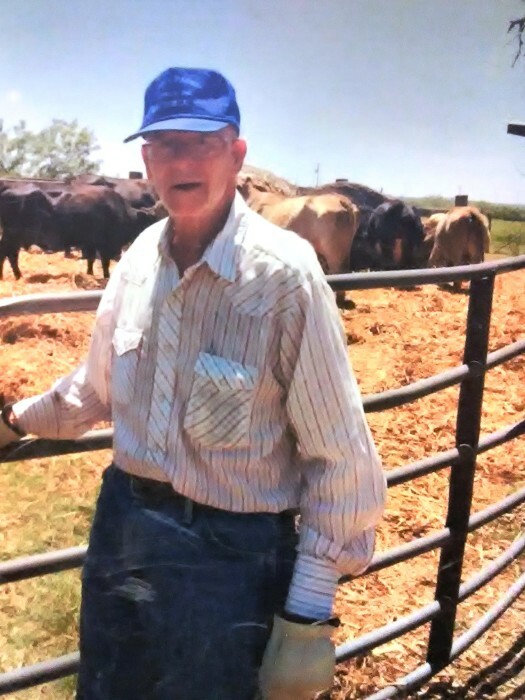 Graveside service will be held at 11 a.m. Saturday, January 26, 2019 at the Afton Cemetery, in Afton, TX, officiated by Raymond Mizelle of Roaring Springs Full Gospel Church. James Musitelli, Rick Collett, Jonathan Collett, Joshua Knight, Denver Nelms, Aspen Nelms, Cody Williams, and Javier Rivero. Services entrusted to Zapata Funeral Home of Matador.